Working from home need not be the only option for Regina entrepreneurs and freelancers who have limited resources. Now there’s Path Cowork, a fashionable shared workspace on the edge of downtown that provides all the benefits of a modern office—and more—for a membership fee that can be renewed monthly. The pricing packages range from $35 per day for an open-space seat that comes with all basic office amenities up to a dedicated desk that goes for $475 a month and includes 24/7 building access, unlimited high-speed internet, reception service during working hours and 10 hours of meeting room use. Justin Lee, general manager of Path Cowork, says the new enterprise addresses one of the primary issues emerging in our changing working world. 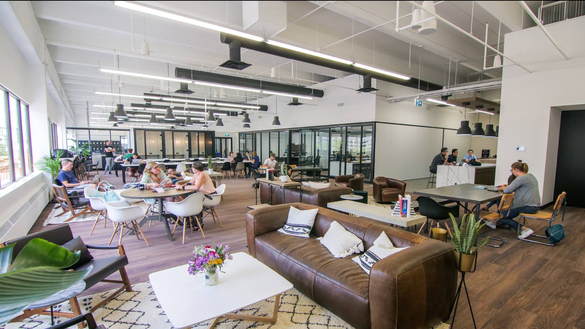 Entrepreneur.com offers a loose definition of “cowork” as a membership-based workspace where diverse groups of freelancers, remote workers, and other independent professionals work together in a shared, communal setting. At Path Cowork, which celebrated its official opening in September after a two month ramp up, several larger, permanent anchor tenants have been added to the mix. And some of them are very, very good neighbours to the 20 or so independent entrepreneurs who are part of the Path Cowork community. “We believe that entrepreneurs and businesses that collaborate have a stronger path to business success,” says Lee. Young entrepreneurs at Path are working in a very supportive environment, he adds. advice, business workshops and seminars, and access to online resources and tools. It’s a sign of the times that two of the entrepreneur tenants at Path are young brothers who own and operate Jimmy’s Cannabis. They have licences to operate four marijuana shops in the province and their investment partners and business consultants work out of one of the anchor businesses in the same space. Path also is home to a videography company that Lee says has landed contracts as a result of relationships built within the Path community, a one-man printing company whose owner is providing business cards to many members of the community, and a tech company that’s building a new app on-site.